With all the harsh winter weather we have been getting lately I wanted to share winter comfort food recipes that won't add on the pounds. Cold weather makes some mouths water for mac & cheese, warm brownies, cakes, pastas and other cold weather comfort food. That could be why so many Americans pack on the pounds during the winter. Stop the weight gain before it starts with some yummy and easy to make winter comfort foods that will satisfy your stomach and your waistline! Try these healthy recipes that I absolutely adore! “Healthy” & “Mac and Cheese” in the same sentence? We say YES it can be done! The key here is replacing some of the ingredients with “guilt free” versions – for instance: whole wheat pasta for regular pasta, low-fat cheese for regular cheese, and including the healthy chefs secret recipe: Greek Yogurt which helps get things creamy without all the fat. Another must? Panko bread crumbs that give you the crunchy top layer you love – because texture is key when making mouth watering recipes! Place tomatoes in a 13 x 9-inch baking dish coated with cooking spray. Sprinkle with black pepper. Bake at 375° for 30 minutes or until browned, stirring occasionally. While tomatoes cook, place bread in a food processor; pulse 2 times or until crumbly. Toss crumbs with melted butter. Sprinkle the crumbs on a baking sheet, and bake at 375° for 12 minutes or until golden, stirring frequently. Cook macaroni in boiling water 7 minutes; drain. Return macaroni to pan; place over medium-low heat. Add cheese and remaining ingredients; cook 4 minutes or until cheese melts, stirring constantly. Stir in tomatoes. Sprinkle each serving with about 3 tablespoons breadcrumbs. This recipe is ALWAYS a crowd pleaser and the amazing tastes and flavors that fill it ensure that you won’t even notice that you’re using “no chicken” broth that you can find at nearly any grocery store! Once again we also bring in our friend Greek Yogurt (or fat free sour cream) to add some creaminess without the fat. What else do I love about this soup beyond the flavors? A cup of it is less than 150 calories and is packed with fiber (thanks to the beans) which means you can fill up on it all winter long! In a large nonstick pot, add olive oil or Canola/Coconut Oil, onions and garlic. Sauté for 2 minutes. Add chopped tortillas, tomato paste, and all seasonings. Sauté for 2 minutes. Stir in vegetable broth and tomatoes. Bring to a boil, turn down heat and simmer, uncovered, for 15 minutes. Add beans, corn and fresh squeezed lemon or lime juice. Mix well. Cook 10 minutes more. 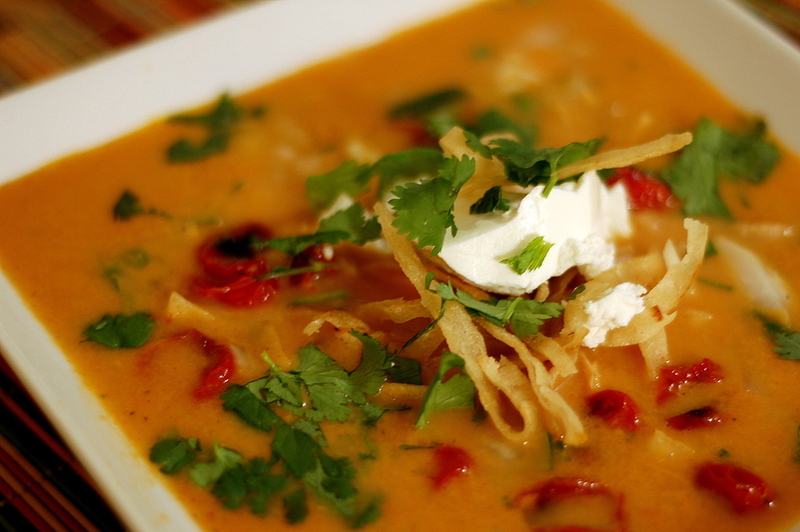 Top each with crushed tortilla chips and yogurt or sour cream, if desired. Makes 12 cups, freeze leftovers and save it for another day. This meal is packed with fiber, iron and B vitamins. 1 cup is 139 calories with only 3grams of fat.